A dental implant is a surgical component that interfaces with the bone of the jaw to support a dental prosthesis like crown, or bridge in order to replace the missing teeth. The basis for implant dentistry is a process called osteo-integration, in which materials like titanium form an intimate bond with bone.The implant is placed first and then an artificial tooth is added following osteo-integration. If maintained properly, implants usually last for a life-time. Why was this option not suggested before? Recent advancements in implant dentistry (with-in the past five years) has made treatment options, which were almost unimaginable some years back, possible now with a good success rate. This treatment uses only 4 implants (unlike traditional methods where 5-8 implants are needed in one arch). The traditional implant treatment usually requires bone grafting procedures,which can prolong the duration of the treatment to minimum of a year. All on 4® do not require a bone grafting procedure as the implants are placed in areas of the jaw where there is more available jaw bone, eliminating the need for costly and time consuming bone grafting, sinus lift procedures. All on 4® Implant treatment saves your time and money, the pains of repeated surgeries and discomfort, to add on. This is one of the best options in case of abundant bone.This is also one of the first preferred treatment options as this gives the highest predictable treatment outcomes. In this process,six to eight implants are placed per arch. Bone-grafting is also done in some cases. Prosthetic options (options to replace teeth) like ceramic bridges, high aesthetic Malo® bridges and so on can improve your appearance too. The artificial teeth look, feel and function more like your natural teeth. These teeth are connected to the implants and solidly fixed in place, and can be removed only by the dentist. And the best, the confidence to laugh without the fear of dropping the denture!! This is a good option for those suffering from loose or ill-fitting dentures. An implant over-denture is a denture that is held in place by means of dental implants. 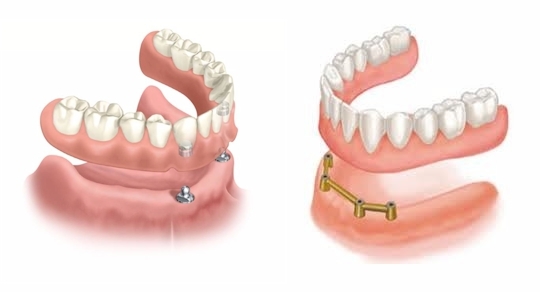 These dentures are retained by clips, bars or fasteners attached to implants. These dentures can be removed by the patient for cleaning. How many implants are required for overdenture treatment? The number of implants may vary from 1 – 4 depending upon each individual. After initial consultation with the dentist and after looking at your CBCT scan report, the number of implants required securing your denture will be decided. Most often, two implants would be sufficient, provided a good bone support is present.This option would add on to the retention provided by your existing denture. Moreover, the necessity to remove your denture at night/during meals can be avoided. Regular dentures tend to be loose and shaky and may require denture adhesives to secure them to your mouth. Implant over dentures secures your denture firmly in place and avoids embarrassing moments of slipping dentures. These implant over-dentures are similar to your regular dentures and they have to be removed at night while sleeping. However, you cannot remove the attaching components over the implants that are present in your mouth which helps in securing your dentures.The existing dentures can be used in most cases, but the dentist should be consulted regarding the possibilities of reusing the denture. However, the implant overdenture cannot give you the advantages of a fixed implant treatment using All on 4® implants. JJ Dental Care has an eminent team capable of all handling even highly deficient bone cases, in addition to a well-equipped armamentarium. We also focus on immediate functional loading of implants (implant placement followed by crown delivery on the same day). In short, we enable you to smile again with increased confidence.